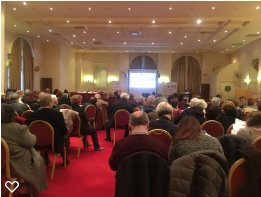 Hellenic League Against Rheumatism held a public event in Volos, Magnesia Thessaly, entitled “CHRONIC PAIN AND RHEUMATIC DISEASES”. The event was organised with the cooperation of the Rheumatic Clinic of University Hospital of Larissa and under the auspices of Municipality of Volos, Medical Association of Magnesia, Pharmaceutical Association of Magnesia and 5th Health District of Thessaly. More than 170 people participated. The event included also an “Ask the expert” session, were the participants had the chance to interact with the physicians, get answers to their questions and have discussions around specific issues that concern them. The lectures were provided by academic rheumatologists, members of Scientific Committee of ELEANA.